What’s in the January Gamer Block M for Mature? I was really excited that there was going to be a Sniper Elite 4 item in this box – I wasn’t overly excited when I saw what exactly said item was. However, I didn’t mind having a useful product in the box that I am able to use and keep with me. I kind of felt like this is one of those products you can get free at any press event/convention, but after receiving the large Fallout bobblehead I wasn’t too upset, since I knew that was the big item! Although you can’t do much with pins, I actually do look forward to all the different designs every month! I’m glad they steered away from putting their own branding on the monthly pins. I have a wide collection of gamer pins on lanyards, and scattered across my office. The Metal Gear theme is pretty unique, and I loved that they picked the Cardboard Box. Super quirky and a nice bonus for the box! The Fallout bobblehead was definitely the highlight of the box! It was very high quality, and looks awesome in any gaming room. I find that in every block box, there is always that one product that stands out compared to the others, and this was it! 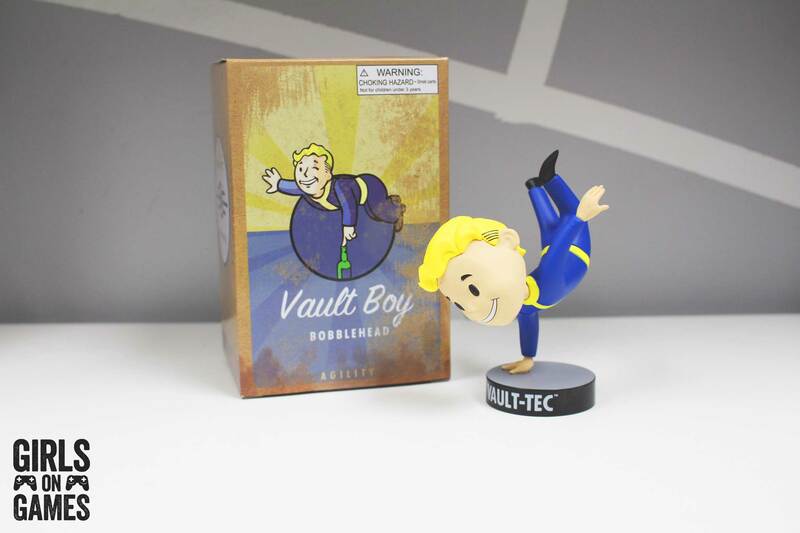 The Fallout bobblehead I received was “Agility” – I’m very happy with it! Not going to lie, I have never really heard of Revenge of the Shinobi before, nor was this something I was particularly interested in. I’m not a huge fan of art prints in boxes, as they are usually small or rolled up. This one came placed at the bottom of the box, and although it’s good quality – I personally don’t think it’s very appealing. This was one of those items I just put aside, and didn’t care too much about. This was a very interesting addition to the Gamer Block. I don’t think I’ve ever received a steam code since I’ve been subscribed to Nerd Block/Arcade Block. I looked up the game on steam, and with the $21.99 price tag it seems like this itself would pay for the gamer block! I’ve never seen this game before, however I the surprise free game was an awesome surprise and I hope we get more steam codes in the future. A great way to build your Steam library, while still receiving some other goodies! 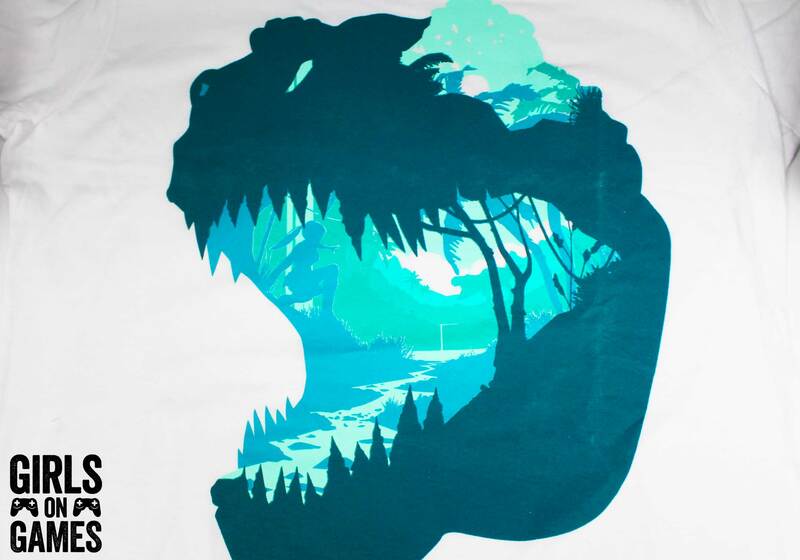 This t-shirt is GORGEOUS! I am so excited to wear this with my leather jacket. The entire image looks like a dinosaur/alligator but when you take a closer look it is actually a scene from Tomb Raider. I love the basic white shirt, and the simples colours. It’s very minimalistic and doesn’t look like a gaming t-shirt, which I like! The Nerd Block t-shirts are always good quality, so I wasn’t disappointed when I received this exclusive shirt! What’s in the Gamer Block E for Everyone? I had never played Parappa the Rapper, but I do remember this PlayStation game from my childhood. The plushie is great quality compared to previous plushies Nerd Block has provided us with, so that was a major plus! This plushie got me thinking: “We need a Spyro plushie next!” I’m sure I’m not the only one who would be thrilled with that. This was my favourite thing in the entire box! 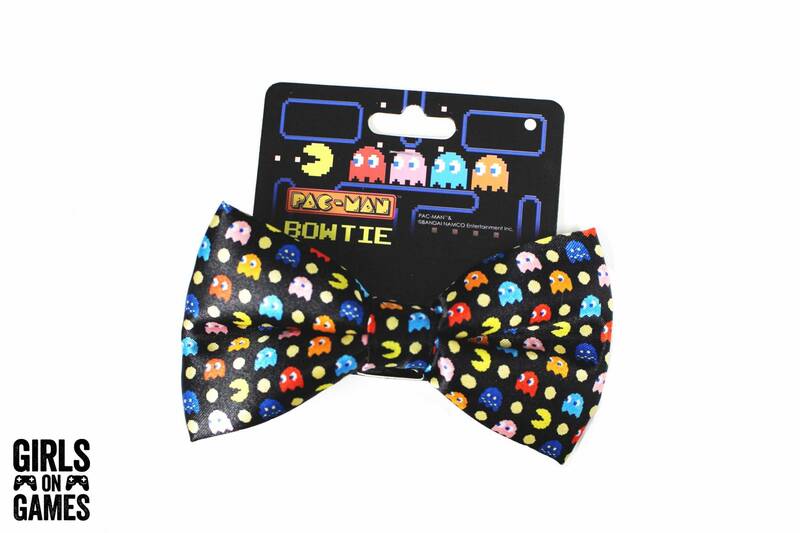 I’m always looking for unique ways to do my hair, and this Pac-Man bowtie would be the perfect accessory to spice up a basic pony-tail. The bow tie is official Pac-Man/Bandai Namco licensing so that was an extra bonus! I love how they incorporated something that is wearable for both men and women! As you may know, the pins are always my favourite part. Ever since they started doing new pins every month I have been looking forward to them! This month we received the Pixel Heart Pin, which definitely matches the Pixel Heart Stickers we received in a previous arcade block. This pin is very cute and geeky, and I’m excited to have it a part of my collection! We received our first ever steam key in this month’s Gamer Block E! The game is very fitting for Valentine’s Day: “Lovers in a Dangerous Space Time”. This game goes for around $15US on steam, which ends up being around the same price of the box when converted to Canadian. The game is an indie space co-op with some amazing 2D art work! When I looked at this month’s T-Shirt I honestly was not thrilled. It kind of felt like I was going back to my hot-topic band days. For what is supposed to be a gamer block, I’m not sure a “band” shirt was really fitting, even though it is for Rockband. This may just be my personal preference, but I feel like there may have been a different a game, or even a better design to make this shirt a bit more “gamer” and a bit less rock and roll? Overall, I’m not completely thrilled with these boxes. If I had to choose a winner, It would be GAMER BLOCK M! The Fallout bobblehead was great quality, and the t-shirt was artistic and still stayed true to the gaming world. I feel like the Gamer Block E could use a bit more work, and I’m looking forward to see how they improve next month. I love the idea of having Steam keys in each box, I think that really works well with the gamer block. However, I really hope these game codes don’t take away from the rest of the block! Another interesting addition to the Gamer Block is the magazine! This month we received the first ever magazine instead of the simple card stock contents listing. The magazine is filled with photos from the community, fun articles about gaming, interviews with some of the team from the Steam key games, and of course a look inside this month’s block with the description of the contents. 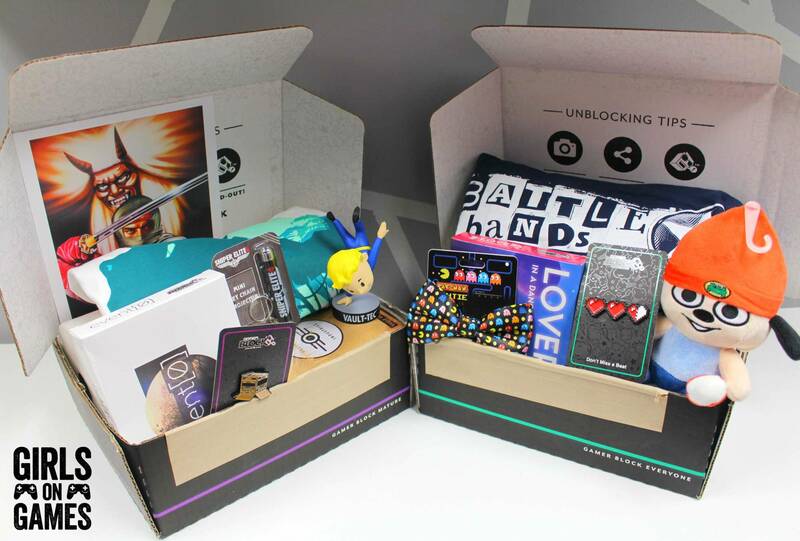 Let us know what you think of the two boxes! Which one do you prefer? DISCLAIMER: Gamer Block review boxes were provided by Arcade Block. The opinions expressed in the article above have not be affected by, dictated or edited in any way by the provider. For more information please see Girls on Games’ Code of Journalistic Ethics.